Order MR and SERV 7 Needles at the bottom of this page. SCHMETZ MR needles are extreme needles specifically designed for multidirectional sewing. These needles have a much deeper scarf to ensure 100% stitch formation when sewing in multi-directions. The carded version has been discontinued and is currently only available in size 5.0/130. While Supplies Last! 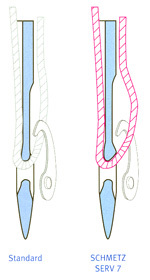 Scarf area with the same needle cross section as the upper blade. Wide space in scarf area for the hook to pick up the needle thread loop. Prevents skipped stitches even on critical materials. 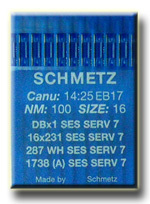 SCHMETZ SERV 7 needles are specifically designed for multidirectional sewing (same as SAN type needles). While the scarf is not modified, the rest of the needle is geometrically different from a regular industrial needle. SERV 7 needles have reinforced blades and feature more material on top of the eye for better loop forming. While these are all round shank needles, they are NOT interchangeable. These are the three (3) most popular/common needles used in long arm quilting machines. Available in a 10 needle chip. The hump scarf (raised collar between the eye and scarf) produces a larger needle thread loop which can easily be picked up by the hook. 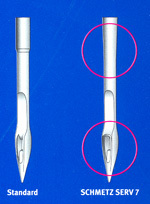 The conical reinforcement of the blade increases needle stability and prevents needle deflection. Effective prevention of skipped stitches. Extremely high needle stability prevents needle deflection. Compared to a standard needle, a smaller needle size is possible without loss of stability. Precise stitches and neat seam appearance. Reduced wear on machine parts (hook, needle plate, etc.) leading to reduced costs. This item has been discontinued. While Supplies Last. Multi-Directional Needle. 135x5 MR. An extreme needle specifically designed for multidirectional sewing. These needles have a much deeper scarf to ensure 100% stitch formation when sewing in multi-directions. Five (5) needles per card. Multi-Directional Needle. 16x231 SERV 7. A longer shank needle with a narrower diameter, used by popular long arm machines. 10 needles per chip. Multi-Directional Needle. 135x5 SERV 7. A shorter shank needle with a wider diameter, used by popular long arm machines like Gammill, Handi-Quilter, Nolting, A1, APQS, etc. 10 needles per chip.